G and I fell in love with each of our rings upon first viewing. As someone who wears jewelry every day for work, I have a bit of OCD when it comes to matching metals. I like to wear all gold or all silver, and only mix when necessary. So I chose mixed metal rings so I would always match no matter what necklace/earring/etc choice I make. My engagement ring is platinum and my wedding band is rose gold. I plan to get another rose gold band for above my engagement ring in honor of my first child. G’s ring is rose gold as well with a tungsten carbide center. He chose the rose gold due to its uniqueness, and it just so happened to match mine as well! Our main decorations were candles at both the ceremony and reception. Otherwise, I kept things as simple as possible. The candles were all mix matched in styles and heights. For the guestbook table, I used a wooden trough I found antiquing for our programs, and a galvanized “S” given as a gift. The church had a hydrangea arrangement downstairs I was able to borrow. Our friend drew a beautiful chalk board welcome sign. We wanted the aesthetics of the day to be downplayed as the ceremony itself was the most important part, so we kept everything effortless and rustic. The last phrase, “Love never fails.” sat at the altar where our tree ceremony was set. (You can find out more about our tree ceremony here.) A rose gold sequin runner lay across the altar under our little evergreen, and other pops of pink were found in scattered bouquets placed along the aisle. Ugh. 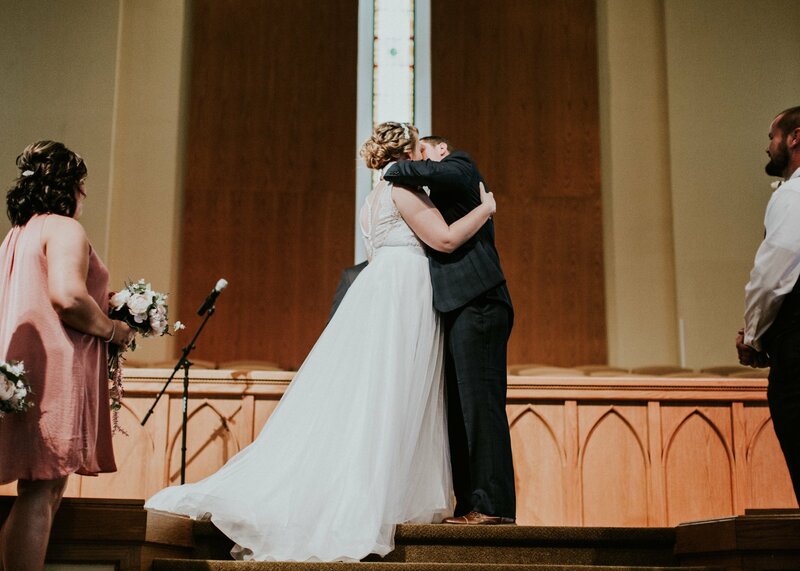 I adore that smile G gave me when our eyes first met when I began my walk down the aisle. … we were officially Mr. and Mrs. G.